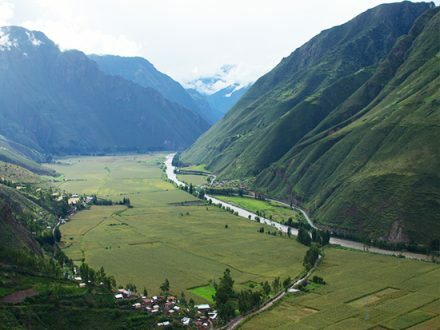 This Tour will help you to discover the beauty of the landscapes of the area around Cusco! 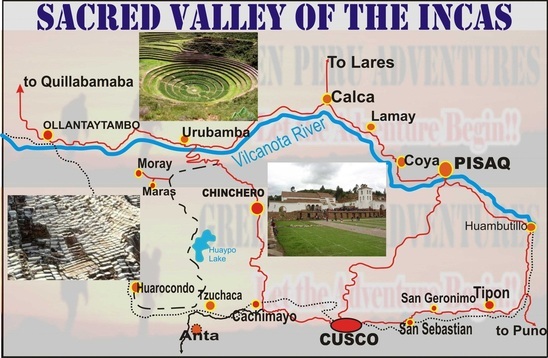 You will learn about the Inca’s technologies and how they used the laws of nature to improve their agriculture, as well as you will discover the extraction of the natural salt from the nearby salt mines, which was a main economical value in the Inca time. You leave Cusco at around 08:30 am, visiting the town Chinchero, Maras Salt Mines and Moray, returning to Cusco around 02:00 pm. The colonial town Chinchero was built on top of an Inca town, surrounded by multicoloured fields whilst it is close to a lagoon of the same name that provides water to nearby agricultural areas. We will pass the town and then directly head to our main destination, the circles of Moray. During our journey we will enjoy the great views of the cordillera Vilcanota snow carpets, where the native people dedicate their lifes to agriculture. 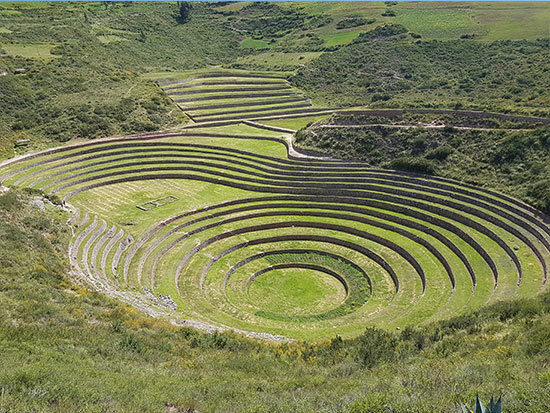 A few minutes drive from Chinchero, we will go off road reaching the main Inca agriculture laboratory, the circles of Moray. 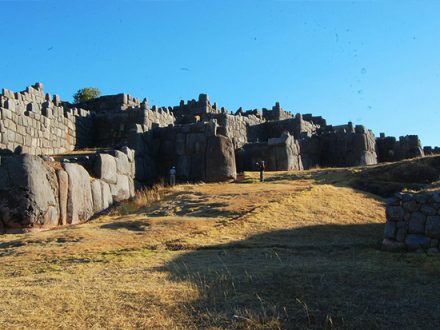 The stone construcion consists of descending circles in a volcano crater, uniformly constructed 150 meters deep, which were used to grow different crops even in the ecosystem of the Andes. This place has an amazing irrigation system, also being constructed with a filtration system to avoid flows and damage to crops. Also, many ceremonies to the earth (Pacha Mama) took place in the deepest circle. 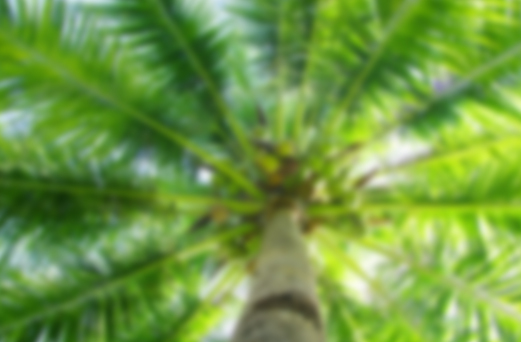 Therefore, this multifunctional location serves as a place for both agricultural and spiritual purposes. A fast 20 minutes ride from Moray we arrive to a little valley where the Salineras of Maras (Maras Salt mines) are located, one of the biggest mysteries of nature. From the depths of the mountain sprouts a spring of extremely salty water. Since the Incas ruled these lands, they used these salt mines and made them up from about 3000 small wells with an average size of about 4 ms² and 10 cm depth. They are exploited ever since until nowadays, producing salt by natural evaporation, a simple natural process: the salty water fills up the wells, allowing the sun to hit and to evaporate the water while the remaining substance left is pure natural salt. We recommend you to buy the General Tourist Ticket that allows you to visit 15 places, including the ruins of Cusco and the museums. Otherwise you can purchase a one day partial ticket which allows a one day visit of the Circles of Moray. This is in case you are not planning to visit any of the Cusco sites. If you are staying in Cusco for at least a few days or even more than a week, we recommend you to buy the Boleto Turistico “Tourist Ticket” which is valid for 10 days and costs 130 Soles (US$ 49.00). 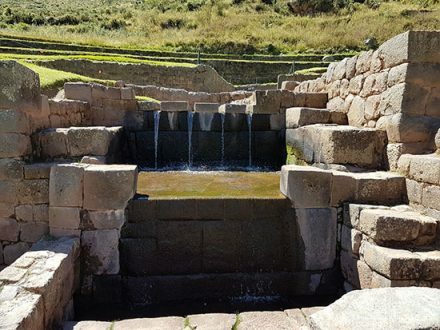 This ticket will be your entrance to visit the 4 archaeological sites in the City Tour, the 3 sites in the Sacred Valley, the circles of Moray as well as the water temple of Tipon and Pikillacta in the South Valley of Cusco. The tourist ticket also includes entrance fees to many museums and the folkloric dance center of Cusco (dance show every day at 07:00 pm).